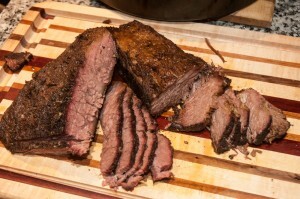 Teal picked up a whole “packer cut” brisket, 14lbs at Costco. . She liberally applied one of my rubs to it and set it aside in the “big fridge” (that is the garage in the winter). This set for 8 hours. 24-48 hrs would probably be better but were running short on time. The whole brisket was then cut lengthwise and the halves vacuum bagged. The reason for the cut was that my biggest bags are only 11″ wide rolls and it would not fit otherwise. More surface area also means more smoke and spice flavor. The bagged meat was then put in the canning kettle with the Anova Cooker set for 170. 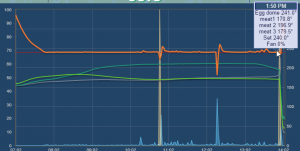 This ran overnight for 11 hours. Next time, I will need to cover the kettle as the water level dropped almost 2″ over night . When the meat was unbagged, there was about 5 cups of juice and a cup of rendered fat. Juice was saved for later. The Big Green Egg (BGE) was started , the Heatermeter hooked up and set for 240. The meat was on at 7AM. Here is a shot of the meat as it first goes on the smoker. The internal temp at this point is about 155-160 degrees. Cherry chunks are providing the smoke flavor. The reason that there are 3 pieces i on one half I separated the flat and point / deckle muscles. The other half was left intact as it was not quite so thick at the point end. 7 hours in the smoker and the temps were approaching the 190 range and it was feeling tender and I was afraid of it drying out if left on longer. So it was pulled off and put in a large covered pan in the oven with the juice that was saved from the sous vide step. Set for 200 degrees for 3 more hours. 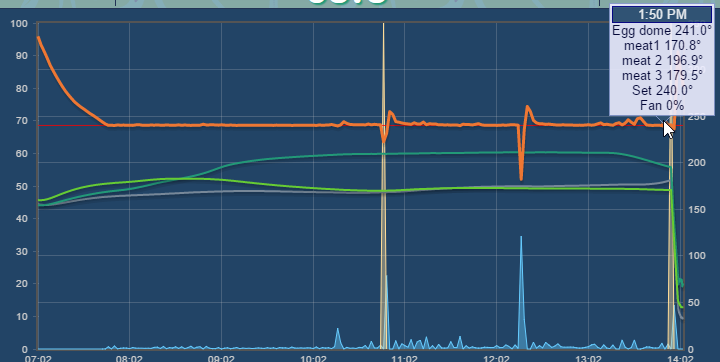 Temperature curves are bit odd, with the big piece seen in the top left rising and then falling. You can see also at the beginning I let the BGE get too hot while tending to other things before putting the meat on. We had most of the kids and their spouses (Elyse, Paul, David and Kelly) over for dinner and the unanimous decision was that this was definitely a keeper recipe. Tasty, juicy meat. Sides were twice baked stacked potatoes, green beans with garlic, sesame and lemon as well as Teal’s buttermilk biscuits. This photo shows just part of the meat. 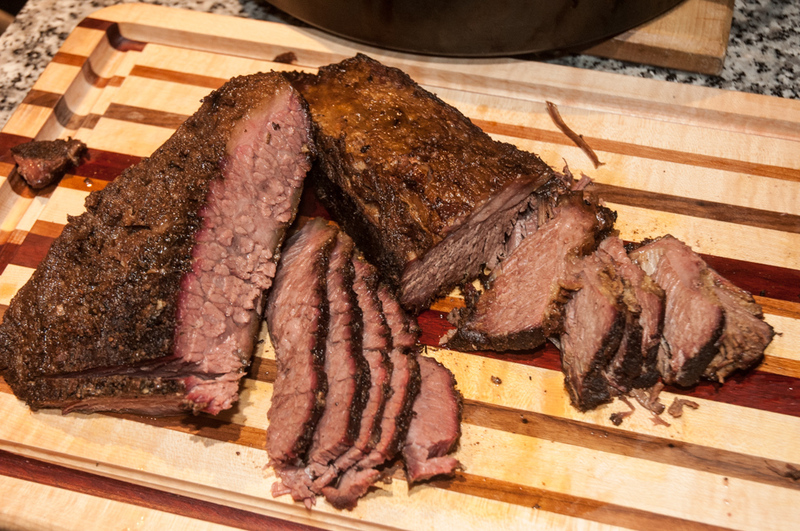 Note the nice smoke ring seen on the left. Definitely not a high speed recipe (who would rush smoked meat anyway? ), but one that is handily done in just over one day. This past summer I talked Teal into letting me get a an Anova Culinary Bluetooth Precision Cooker . It was a bit of a stretch as she once again thought I was crazy and then crazier still when we then went to Costco and picked up an enormous roast. The roast was portioned out into 1.5-2″ thick slices and seasoned with salt, pepper, garlic and fresh thyme, marjoram and oregano. Each was then vacuum sealed, dated and thrown in the freezer, except for for the first dinner. 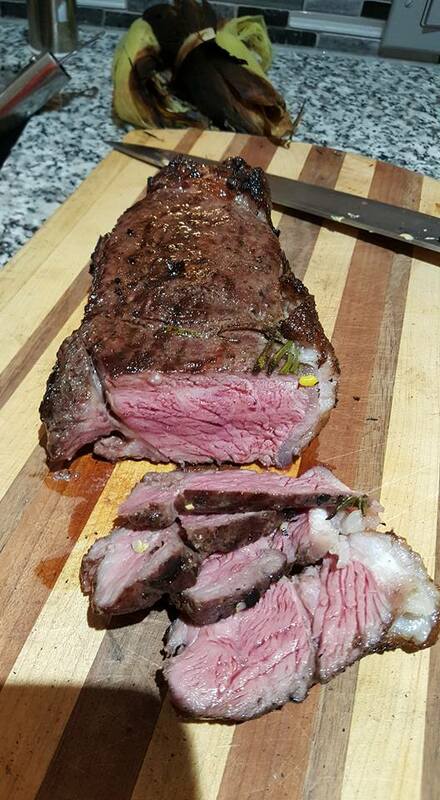 First steak was cooked at 129 degrees for 90 min. 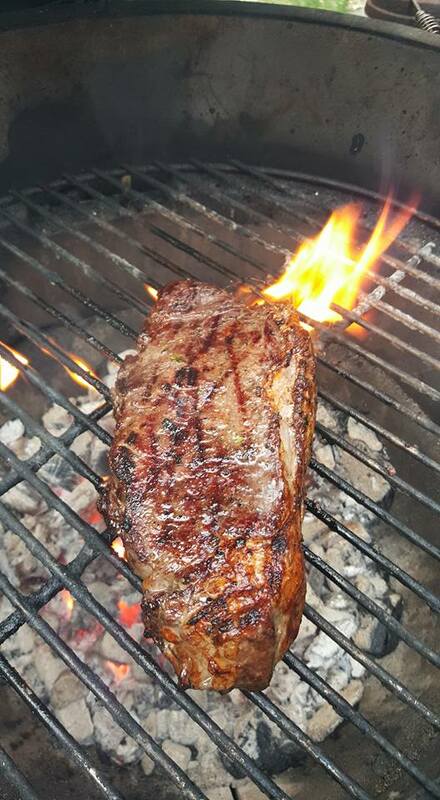 We have since moved to 130 for 2 hours as the sweet spot for these steaks as our standard. Prior to grilling remove as much fat as you can. This prevents flare ups and a sooty / bitter exterior. You want a clean crisp dark brown but not black surface. Grill needs to be blazing hot 700-900 degrees for 2-3 min per side. 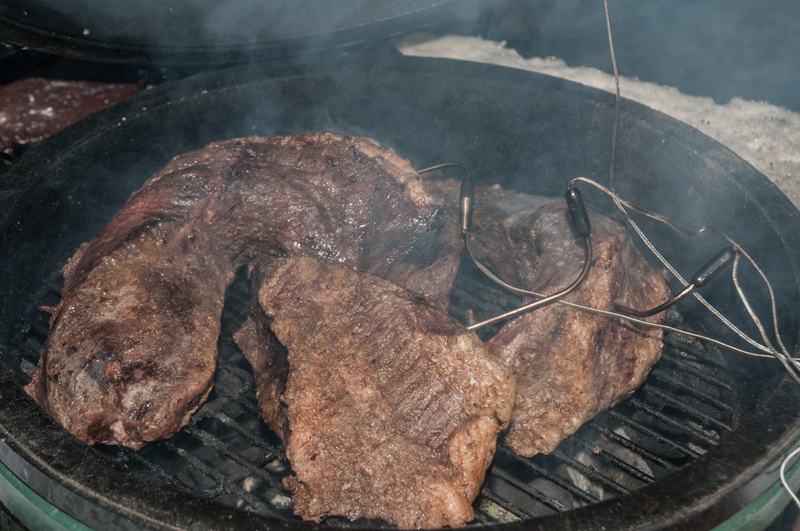 I use the Big Green Egg but you can get similar heat by placing the grill right on top of the charcoal chimney. Note that the sliced steak photo is NOT the way to go – trim the fat and life is much easier. The technique works perfectly whether doing 1 or 6 of these . Perfectly consistent and fork tender. 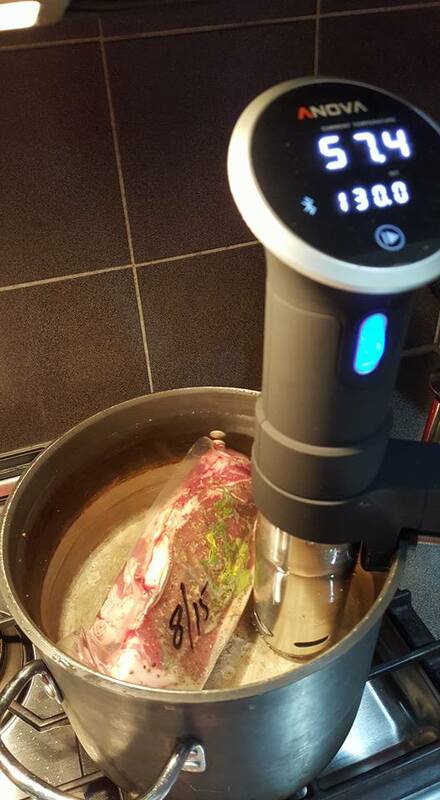 The Serious Eats and Anova web sites provide lots of ideas for Sous Vide cooking. I also strongly recommend: The Food Lab: Better Home Cooking Through Science by Kenji Lopez Alt. I first ran across his posts on Serious Eats and the book is a must have for anyone who is looking to go from just experimenting a bit to really understanding what they are doing in the kitchen. The CNC router has achieved functional status. That is I can now with modest effort actually make useful things. These can be furniture pieces or parts for the router or other tools. One of the hard parts has been zeroing out each of the axis. X and Y i have been doing with a standard edge finder. I particularly like the 1/2 inch diameter ones like this one: Brown & Sharpe 599-792 Edge Finder Single . The smaller diameter (typically .2″ diameter touch) are bit small for woodworking due to the rougher surface of the wood and the large ones seem to be easier for me without false indications of the edge. The way I am currently setting up my fixturing on the CNC table, I have a left size (x axis work zero) fence and some movable stops from Rockler in the table slots. This works out quite well. I measure from the stops / fence to the home position and modify the zero references and I am off and running for several projects. The hard part has been easily zeroing out for cutter height. This has to be done after each tool change and is just plain tedious. So I was determined to set up a touch plate and have that working with the Mach 4 controller software. This took a little bit of time. First was getting the Mach 4 “Probe” input working. It requires at least version 2803 of the Mach 4 software which I am using with the Ethernet Smooth Stepper (ESS) version 130 software. The touch plate is simply a block of acrylic plastic about 3/8″ thick with a sheet of brass mounted on top and connected to the “Probe” input. The router spindle itself is grounded for safety and this conveniently completes the circuit for the touch plate. In October of 2105 we went to Indonesia with the group from Underwater Connection. The primary destination was Lembeh Straight. Lembeh is well known for what is often referred to as “muck diving”. It is really that you are diving on a black sand bottom. The depths are typically quite shallow (<30 feet) and visigbility is not great. The slightest movement can easily stir up clouds of debris and swirling sand which takes minutes to settle back down. The goal of this diving is to see the many rare and unusual critters that inhabit this area. It is macro photography heaven. We stayed at Kasawari Lembeh resort. This is a small boutique resort with excellent service and attention to detail. One of the key details was the small groups on the dive boats. Typically 6 divers to a dive guide. The guides are a necessity. We were looking for critters that were well camouflaged and often the size of your fingernail. We often wondered : “How did they see that?” However, after a few dives we started spotting some on our own but still not with the regularity of the guides. 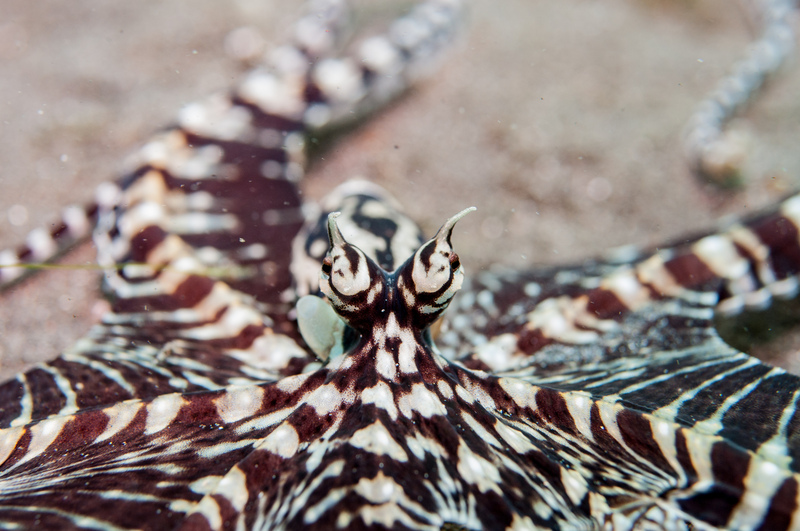 On many trips we feel lucky to see an octopus or a small group of squid on a trip. Here we had the fun of seeing as many as 5 species in a single dive! 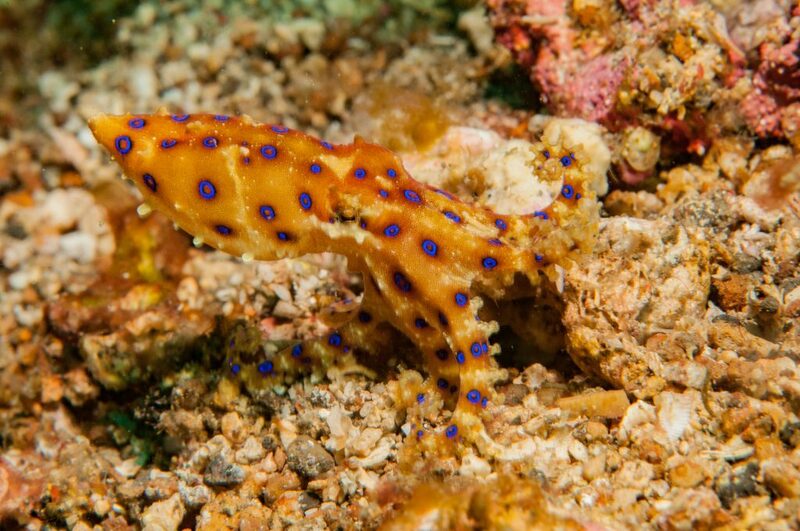 These included coconut octopus, mimic octopus, wonderpus, blue ring, flamboyant cuttlefish and more. Dozens of nudibranchs (including mating couples), and an endless variety for shrimp and crabs. These were taken with a Nikon D300S, Nikon 60mm macro, Subsee+10 wet diopter, Ikelite housing with glass flat port, Ikelite DS125 strobe and a Light and Motion Sola 600 as a focus light. The side lighting pf the focus light was extremely helpful to find the target and actually provided nice fill in of the shadows. The overall murky conditions were best suited to macro. I did not get a chance to do any significant wide angle shots. For those I use a Tokina 10-17 and Ikelite 8″ dome with a single strobe and diffuser.